One of my favorite bloggers, and now cookbook authors, is Deb Perelman who writes Smitten Kitchen. I’ve made a lot of recipes from her blog over the years, and I’ve loved every single thing. So I was really excited to try out the recipes in her cookbook, which my mom got me for Christmas. I was so fired up, I wanted to make something right when we got back to town, before I’d had time to go through and plan what to buy. Based on the ingredients I had, I was able to adapt one of her salads into my own creation. And although I’m sure the original version is scrumptious, my salad turned out delicious as well. This week is the third week in a row that we are having this for dinner. And for those of you looking for a new cookbook, I highly recommend picking this one up (I think my mom found it at Costco). For lunch, I love something fast. On weekdays, I need something I can easily take with me to work/school, and on the weekends, I’m normally busy and grabbing lunch in between errands or after getting back from a workout class. It doesn’t get much easier than an open faced turkey sandwich. No really. Here I’ll prove it. Place a yummy piece of bread on a plate (I recommend some sort of artisan bread, not just your typical loaf of sandwich bread). Place a few pieces of turkey on top, followed by cheese if you want it, but not necessary. 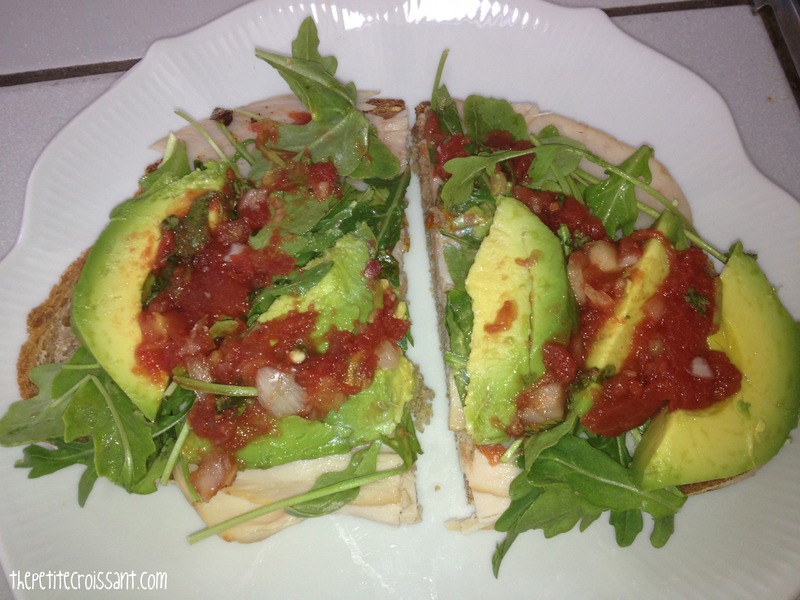 Top with a handful of arugula, a few spoonfuls of salsa and slices of avocado. And that’s it. Fresh, delicious, and took less than five minutes to prepare. 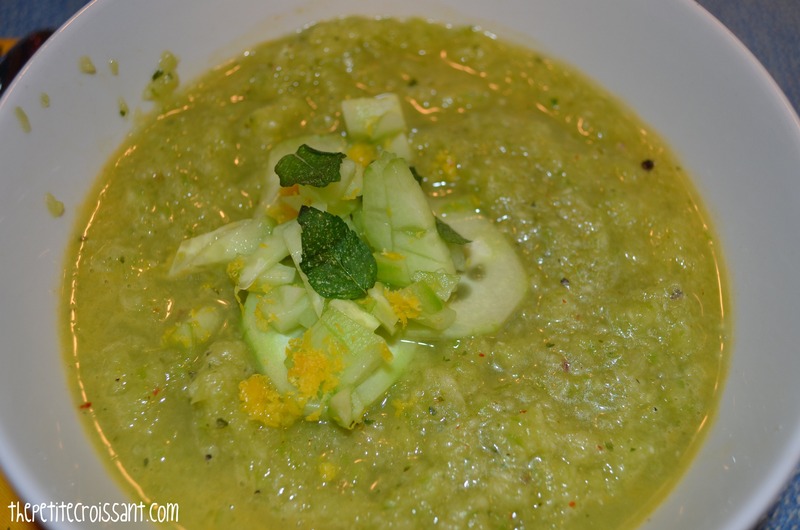 At a dinner party this summer, our friends made an amazing spicy cucumber gazpacho that I wanted to recreate. I decided it would be the perfect thing to take to jazz in the sculpture garden on a humid Friday night. But as luck would have it, jazz got rained out. But we still really enjoyed this soup. 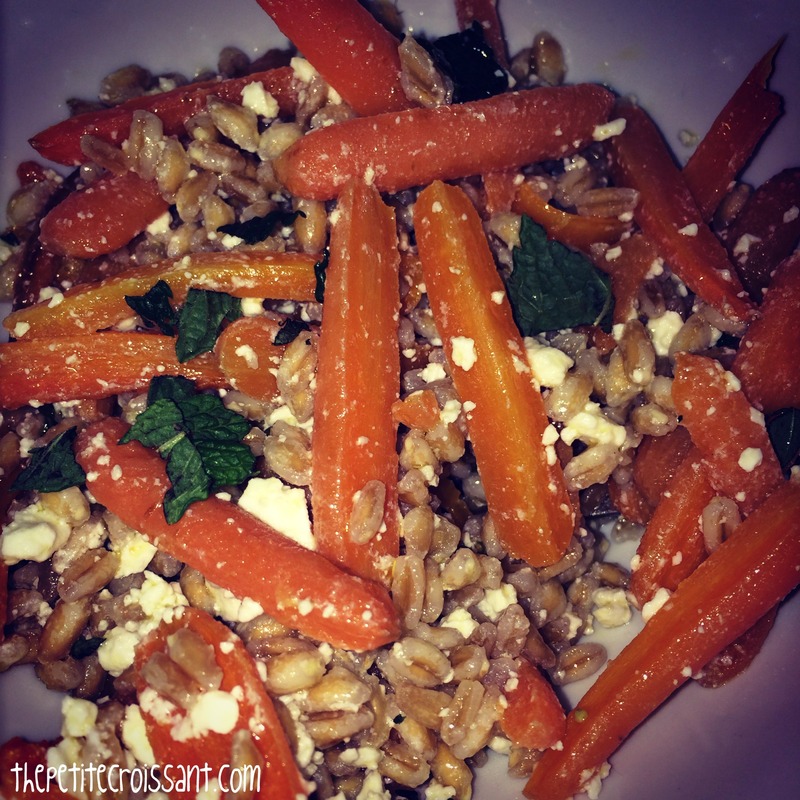 We ate it for dinner with some garlic bread, but you could also serve it as a light summer appetizer. Growing up in California, I ate a lot of home grown squash, zucchini, and eggplant. In the summers, people with big gardens were basically giving these vegetables away because they had so many. So I thought I’d seen most of the ways to use these guys. 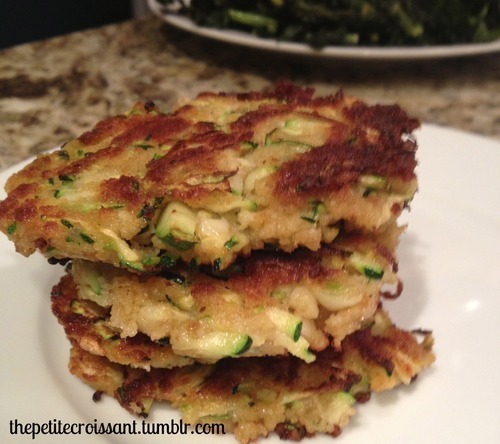 But last summer, I discovered a new great recipe to use any extra zucchinis – zucchini fritters. And I’ve started making them again almost every week. For anybody who has lived with me (especially in my single days), you know that I used to subsist on a combination of tortillas, black beans, hummus, spinach and salsa for a good portion of my meals. I’d throw in some other random items when I had them in the fridge, but the majority of the week, I’d saute some spinach and throw it, plus some salsa, black beans and hummus into a flour tortilla and call it dinner. 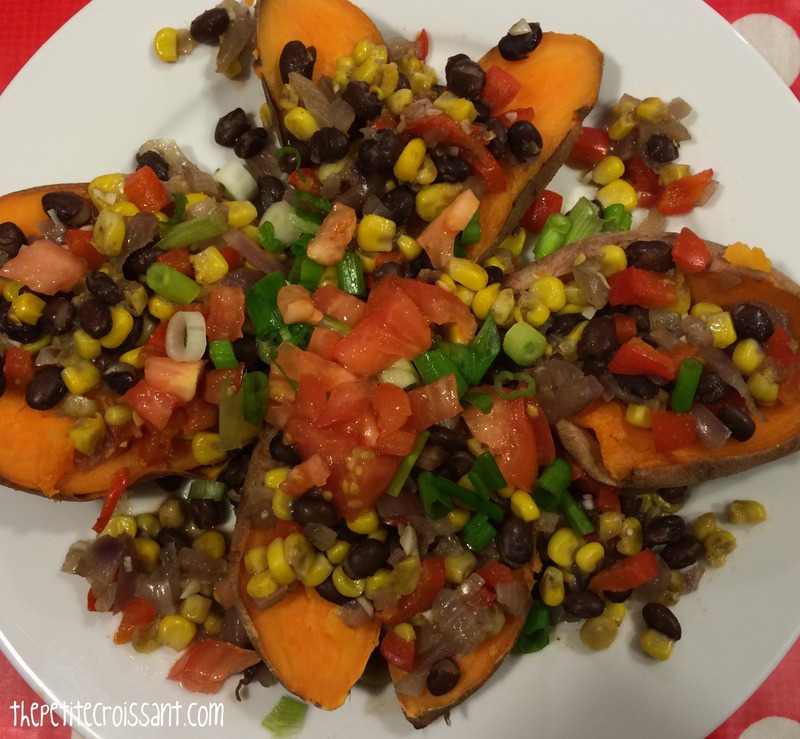 Fast, easy, and pretty healthy.But as you know, I’ve tried to up my dinner game since moving in with Dave. And while I have definitely upgraded, I still have to go back to my roots every once in a while. The difference is that now, I get slightly more creative about what I throw in the mix, and I take the extra five minutes to turn this deliciousness into a quesadilla instead of just throwing it in a cold tortilla. 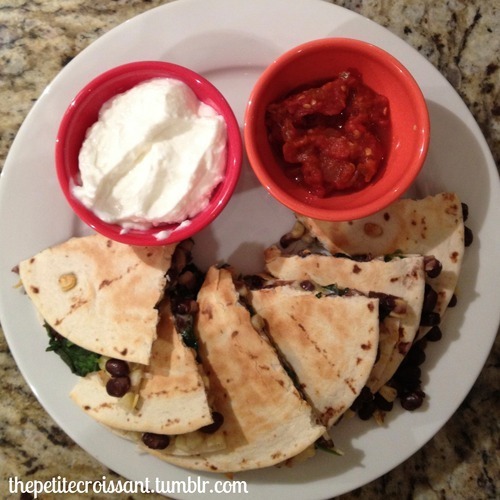 So in honor of Cinco de Mayo last weekend, here are a few of my favorite combinations for quesadillas (or dillas as they are lovingly called in our house). I’m all for the easy salad. Lately, we’ve been eating a lot of them (still making up for our trip to Charleston and in preparation of a vacation where we’ll be spending a lot of time in suits). 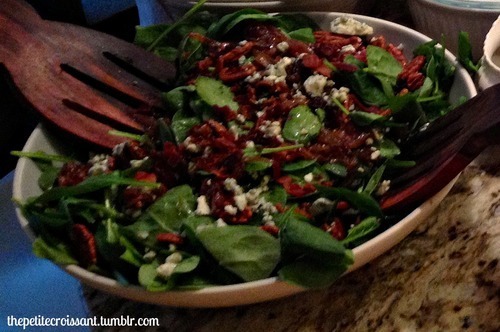 My newest favorite salad involves spinach, bacon, caramelized onions, apple, blue cheese, candied pecans, and a balsamic dressing. I love the combination of flavors!